I know so many of you are still looking for a good deal on UGGs. They are expensive but every once in a while there is *HOT* deal over at 6pm.com. Today is one of those days! UGGs is having a “One Week Sale” but I bet they will sell out before then. They have the short classic boot for only $105 in select colors, regular price is $150. 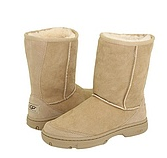 Head over to 6PM.com and check out this hot sale if UGG boots are on your list! *HOT* 40% Off UGGs Sale! They have the short classic boot for only $90 in select colors, regular price is $150. Head over to 6PM.com and check out this hot sale if UGG boots are on your list! When I got married, my husband told me that my Uggs couldn’t come with the marriage. He said they are “ugly” and hated them. I’m on my third pair and he has had two since then. I LOVE Ugg boots and feel like they are an investment, not a random purchase. 6PM.COM has Ugg boots on sale at 36% off. There are several styles to choose from. They have the Classic Short Boot which retails for over $200, for as low as $99. This is the lowest price I have ever seen! Head over to 6PM.COM and search for Uggs in the search box. You’ll get all the top deals on Uggs!